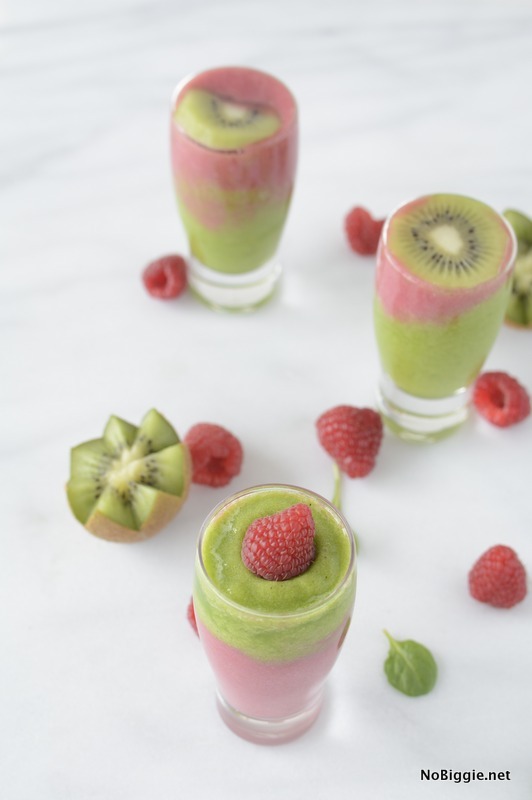 Start your day off right with this delicious kiwi raspberry layered smoothie. Sometimes I’m in awe of the beauty of the fresh fruits and vegetables we have to cook with and eat. The vibrant colors that come from nature are so gorgeous, don’t you think?! Plus you can enjoy them feeling good knowing you’re making healthy choices. Here’s a fun spin on your usual smoothie routine: try layering two different smoothies together. 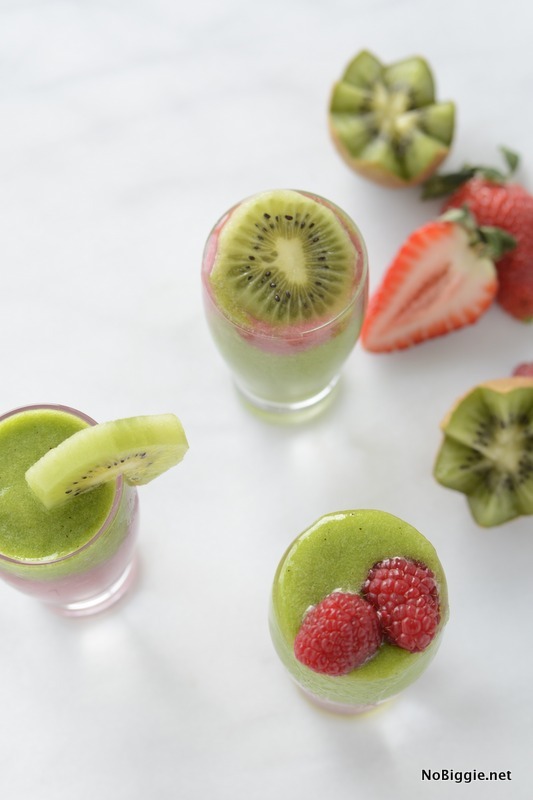 Don’t forget to buy a few extra kiwis and raspberries for a fruity garnish. Here’s the thing with smoothies…once you add anything green, the smoothie will blend to be the color green, and the same goes for red. So if you want to guarantee the color of your smoothie, avoid mixing these dominant colors together. If you want a purple smoothie just add blueberries. I’m loving little dessert parfait glasses like these, they’re perfect for showing off colorful food. 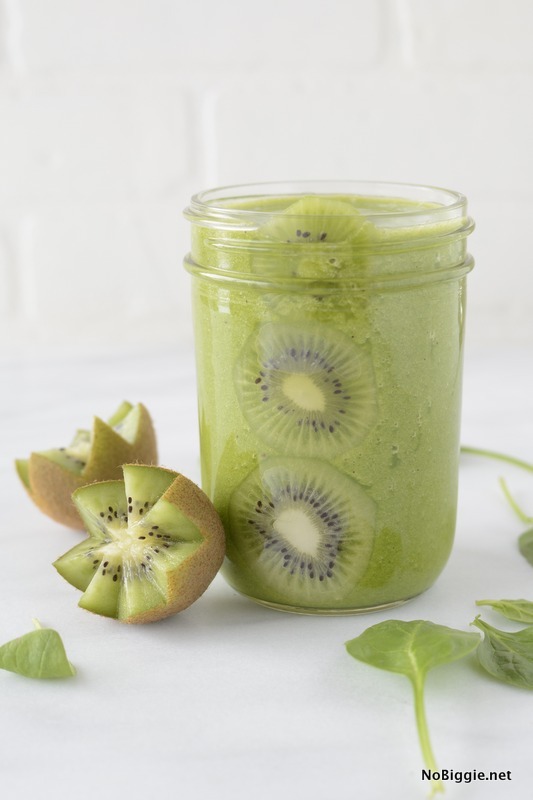 Trying to get my kids to eat raw spinach is a scary thought, but when you blend it up into an icy cold smoothie, they don’t even think twice about it. If you can start the day off eating right, it’s easier to not stress about how the rest of the day goes when it comes to good nutrition. Having a good blender makes all the difference when it comes to making great smoothies. I’ve mentioned my love for my Blendtec so many times, but when it comes to blenders…it really is the best. Plus I loving knowing that it will last and last. We used to have one of those bullet blenders, and then the plastic pieces started to break off. We’ve been so happy with our Blendtec Blender. 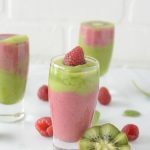 It’s an investment appliance for sure, but one you can feel good about…especially when you make healthy things like this kiwi raspberry layered smoothie. 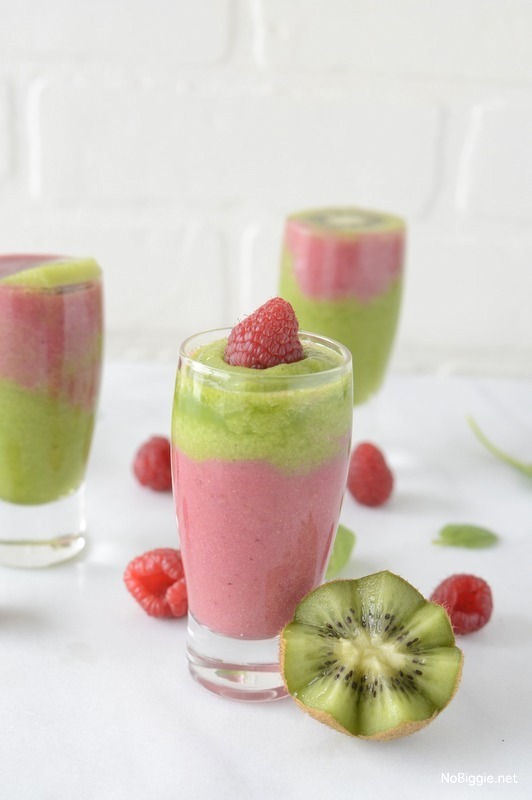 Switch up your morning smoothie routine and try a layered smoothie. We love this flavor combination! 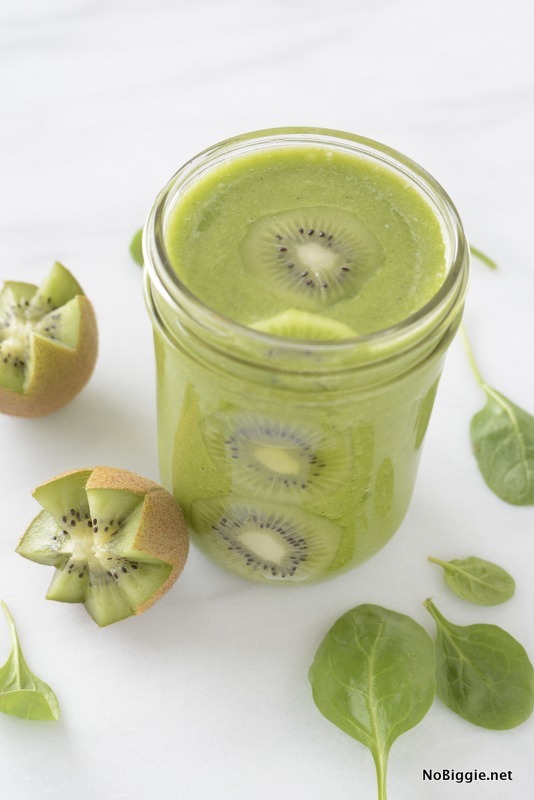 For the kiwi spinach smoothie: Place all the ingredients in a blender and blend until smooth. Add more water to help it blend if it's too thick. For the raspberry smoothie: Place all the ingredients in a blender and blend until smooth. Add more liquid to help it blend if it's too thick. 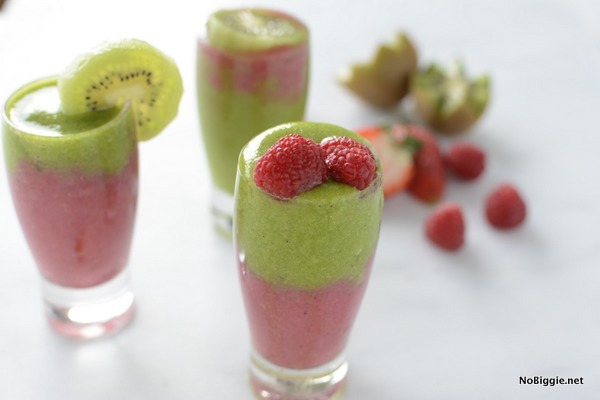 Layer the smoothies into the glasses. Garnish each glass with a little fresh fruit. Enjoy! Here’s to a healthy start to the new year!